In We’re No. 1, The A.V. Club examines a song that went to No. 1 on the Billboard charts to get to the heart of what it means to be popular in pop music, and how that has changed over the years. In this installment, we cover Huey Lewis And The News’ “The Power Of Love,” which spent two weeks at No. 1 on the Billboard Hot 100 chart starting on August 24, 1985. The key word here is “eventually.” The song plays faintly in the background of the movie’s original trailer, in sharp contrast to its prominent placement in the film itself. And “The Power Of Love” debuted at only No. 46 on the Billboard Hot 100 chart a week before the movie opened. But after Back To The Future was in theaters, people came to know the tune as an integral part of the film. Near the beginning, Fox hops on his skateboard, late to school because he was messing around in Doc Brown’s lab. As he whizzes through the streets of Hill Valley, the song kicks into gear, emboldening his travels. In fact, Fox’s wobbly board movements grow stronger (and his risks, such as grabbing onto moving cars to aid his travels, more reckless), culminating in an airing of the chorus that punctuates with the line “Can you feel it?” just as he arrives at school. According to Back To The Future’s music supervisor, Bones Howe, director Zemeckis only put the original song at the start of the film out of necessity; anywhere else, and it would’ve been too close to a scene later in the movie where the song appears. Yet “The Power Of Love” is the perfect way to kick things off, as there’s a striking juxtaposition at play: The song is both a calm, steadying presence and something that feels slightly renegade and rebellious. It’s a good description of Huey Lewis And The News as well. By the time 1985 rolled around, the band was king of both the rock and pop charts, thanks to the multi-platinum success of 1983’s Sports. This success was a long time coming: Lewis and keyboardist Sean Hopper were in the band Clover, which made a go of it in the ’70s both in the Bay Area and in the U.K. The band’s achievements then were mostly due to association—Clover toured with Thin Lizzy (in fact, Lewis contributed a harmonica solo to the band’s Live And Dangerous release) and several members of the band backed up Elvis Costello on My Aim Is True. Clover broke up in the late ’70s, and as the 1980s dawned, Lewis had recruited Hopper and other San Francisco music vets for a band that eventually coalesced into Huey Lewis And The News and landed a deal with Chrysalis Records. Sports was actually the band’s third record, following up a self-titled 1980 LP that People said “sold a pitiful 30,000 copies” and a more successful 1982 LP, Picture This. Although Huey Lewis And The News had been on an upswing since the latter album (thanks to the Mutt Lange-penned hit “Do You Believe In Love”), Sports found the band perfecting a sound that never felt beholden to one genre or era. Songs such as “Heart And Soul,” “I Want A New Drug” and “If This Is It” managed to be both contemporary and retro, their nods to Motown and Stax soul and classic rock boosted by modern-sounding keyboards and production. 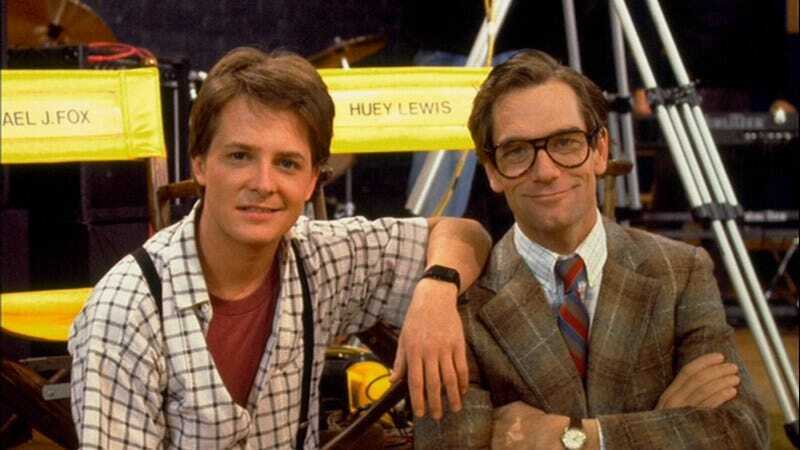 Throw in Lewis’ rakish good looks and self-deprecating demeanor in the band’s colorful videos, and it’s easy to see why the band became so popular: Huey Lewis And The News put a fresh, modern spin on time-worn sounds, making the band an accessible extension to the existing musical continuum. Lewis wasn’t restricted to writing a song by the name “Back To The Future,” which helped. Still, his assessment of his band’s shortcomings where it came to soundtrack work was apparently correct: “My recollection is the next thing we wrote is ‘Power Of Love,’ but [Zemeckis’] recollection is we sent him one song that he didn’t think was fabulous, and he explained something to me,” he told The A.V. Club. “Then I went, ‘Oh,’ and came back with ‘Power Of Love.’ But I don’t even remember that.” Indeed, music supervisor Howe recalls a more drawn-out process in an interview published in The Billboard Book of Number One Hits—one that involved a song that slipped through their fingers (Lewis gave “In The Nick Of Time” to the movie Brewster’s Millions) and “The Power Of Love” arriving mere days before Back To The Future went into its final mix. That’s somewhat of an understatement: The chunky-but-staccato hooks pulsing through “The Power Of Love” give the song a crisp, propulsive edge, and serve as a velocity-laden counterpoint to underlying soul grooves, a bluesy guitar solo, and Lewis’s expressive, gravel-sounding and soul-filled vocals. Lyrically, the tune is a mash note to the chameleonic nature of love itself: In “The Power Of Love,” the emotion is an egalitarian, nondiscriminatory thing that can be redemptive and ruthless at will—a forceful whirlwind that’s ultimately good to have around. As with the songs on Sports, “The Power Of Love” was self-produced by the band. Mixing was handled by ’80s radio Svengali Bob Clearmountain. This creative freedom was a point of pride for Lewis, who had actually left Clearmountain detailed directions on how he wanted the song to sound. In a 2014 interview with the blog Whopperjaw, he animatedly recalled his label’s subsequent attempts to fudge the musical direction, specifically by ambushing him with an unexpected remix. “We go to Chrysalis and they play us Clearmountain’s mix of ‘The Power Of Love,’” Lewis said. “Which sounds okay. It doesn’t sound particularly great, to be honest with you, but it sounds okay. The problem seemed to be that the remix was a surprise, because Luongo—an industry veteran who was known as an innovative remixer, mixer and producer—was on friendly terms with Huey Lewis And The News. In fact, Luongo had done a dance remix of “I Want A New Drug” in 1983, to the apparent delight of everyone involved. Speaking to The A.V. Club, the remixer recalls Lewis inviting him to see the band play at Madison Square Garden, because he had a “surprise” for the remixer. “The surprise was, he loved what I did with the mix so well, and so much, that he changed the entire arrangement of the song to fit my mix,” Luongo says, specifically citing the beginning chord progressions becoming more prominent. (Comparing the Sports studio version with a mid-’80s live version and Luongo’s remix bears him out.) “I went backstage, and him, his guitar player Chris, the drummer, everybody—they were hugging me,” Luongo recalls. Luongo’s version of the song even had a chance to see the light of day, according to Lewis in the 2014 interview: “Mutt [Lange] says to me, ‘Huey, man, you know you should really go with the John Luongo mix, man. I mean, it’s much more powerful.’” (“That makes me feel so good,” Luongo says. “I am the biggest Mutt Lange fan in the world.” ) Still, the endorsement wasn’t convincing enough. In the end, Clearmountain’s mix won out, and was released and backed with extended and dance remixes by Jellybean Benitez. Luongo’s mix, meanwhile, was released in limited editions to DJs, and is far more obscure today. Thanks to MTV and radio support, “The Power Of Love” became Huey Lewis And The News’ first No. 1 single in the U.S. and was also a hit in Canada, Australia, and the U.K. (“We never had an international hit,” Lewis told the Austin Chronicle in 2011. “To this day, it’s our only real international hit.”) The song was also nominated for an Academy Award for Best Original Song—it lost to Lionel Richie’s “Say You, Say Me”—and went gold. Thirty years later, the song is still an integral part of Huey Lewis And The News’ setlists, while The Hold Steady covered it for A.V. Undercover in 2011. Interestingly enough, a 1985 Rolling Stone article, “Soundtracks Thrived in Summer of ’85,” quoted then-Columbia Pictures’ Senior Vice President of Music Gary LeMel as saying he didn’t believe the song “added any money to the [movie’s] box office, because most people don’t even know it’s from a movie” because it wasn’t named after the film. Nevertheless, the song’s place in pop culture immortality was cemented by its inclusion in Back To The Future. Partly this is because “The Power Of Love” doubled as a notable plot point: The song appears in sloppier electric form, performed rather badly by Fox and his group The Pinheads. In fact, they’re told they’re “just too darn loud” by none other than Lewis himself, making a winking cameo as a snobby judge. Partly this is also because the song ended up appearing in both sequels as well, in a nod to continuity and an inside joke to fans. It became a part of the trilogy’s canon as much as any of the notable dialogue.